Do Hot Camp Propane Showers Work? Most outdoor camping showers are pretty simple affairs. After all, you can’t get much more low tech than a bag of water with a spigot. Maybe the bag has a built-in pouch to hold your shampoo, or it’s made out of a material that’s designed to maximize heat transfer and retention, but at the end of the day you’re still dealing with a bag on a stick. And more often than not, you’re also dealing with a lukewarm with the sort of water pressure that’s more reminiscent of a little kid’s squirt gun than the torrent you’re used to at home. Sure you can check out our guide to the best camping showers to separate the wheat from the chaff, but what if you’re looking for a real hot camp shower? There are options there too, like an electric or propane shower, but you’re going to end up paying a premium. Solar showers are okay for what they are (and they’re cheap as free to operate), but even the best solar shower bag can’t hold a candle to a propane shower. These portable camp showers typically consist of two separate parts: a propane burner and a tank. The tank sits on top of the burner, and the water inside it is heated up by the flame. And when it reaches the desired temperature, you’re in for a real treat. Sure you’re still showering outside (and in full view of the neighbors, unless you’ve got some type of curtain or portable shower enclosure), but it’s tough to beat the temperature and pressure you get out of a propane shower. The least efficient of these hot camp showers provide you with hot water after about 20 minutes, while some of the newer units provide on-demand, piping hot water any time of the day. And what’s more, some propane showers use burners that double as cooking stoves. ZODI has been making propane showers for ils a while now, and they pretty much have it down to an exact science. 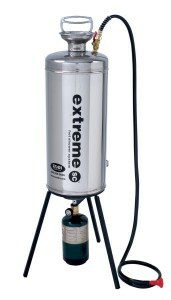 Their Outback Gear Extreme shower is one of the most highly rated hot camp showers. This propane shower is the next best thing to instant-on, providing hot water about 10 seconds after you turn it on. 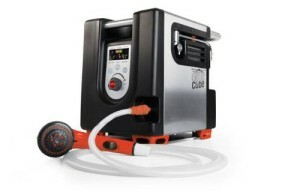 Powered by a 10,000 BTU burner, it heats water to a temperature of up to 100 degrees Fahrenheit, which is delivered by a long six foot hose. Most propane showers aren’t much higher tech than solar shower bags, but the Aquacube Series III is billed as “digital” and “cordless.” Essentially that means the unit is equipped with a digital LCD display that shows you all of the pertinent information about the unit (whether the flame is ignited, status of the battery power, water temperature, etc). Since it has a built-in rechargeable batter, you don’t need to plug it into your camper for normal use. The unit has two outputs: a shower head and tap, and it includes a toggle to switch between them. That means you can use this propane shower for showers and to provide hot water inside your camper. If you have an especially small or lightweight pop up camper that doesn’t have a hot water heater, this is a feature that can’t be oversold. Stay tuned for our hot camp shower comparison grid!